The World Bank projects that by 2050 the population of the continent will have doubled, meaning that the region will have added 3.5m people per month. While the benefits of such population are enormous, Africa should strive to put elaborate measures to ensure affordable and adequate houses are available to avoid a crisis. The issue of housing shortage in Africa is well documented. Kenya for example has a housing gap of approximately 2 million homes, for example, while more than 12m people in Egypt live in informal buildings. Experts have long argued that conventional building material such as sand and cement cannot allow construction of low-cost mass houses. “The use of brick and mortar in housing construction is expensive and as such has denied Kenya and other African countries the impetus to build million of houses needed to curb housing shortage in the country,” says Moses Thuku a property developer in Kenya. If we can use more sustainable building materials such as straw, bamboo or clay as construction materials, that can be a major step forward. However, some Africa countries have no legal framework to support such proposals. But in Ghana one company is using the traditional ‘rammed earth’ technique to help address a 2 million housing deficit. Hive Earth uses locally sourced materials such as clay, laterite and granite chippings which are abundantly available in West Africa, says Joelle Eyeson the company’s cofounder. “Our aim is to build houses that our workers and the majority of Ghanaians and West Africans can afford. The prototype that should be ready by the end of the year will cost roughly $5,000 for a one-room house,” She tells DW. The rammed earth technique is a mixture of laterite, clay and then granite chippings. A small mount of cement or lime is used to bind it. “We wanted a way of building without using cement, because it is very toxic; especially in our climate it combines with the heat and humidity and creates a really bad indoor air quality,” explains Ms Eyeson. The sale of portable cabins is booming in New Zealand, where a housing crisis means hundreds of thousands of Kiwis can no longer afford a home or even a rental. Soaring property prices in New Zealand’s largest cities and a slow pace of new builds has seen many low- and middle-income New Zealanders struggling to afford basic housing, with some forced to sleep in shipping containers, tent and cars. Transportable housing manufacturers say their businesses have quadrupled in the past few years, with many New Zealanders unable to see any viable solution to their housing woes other than the cramped, transportable homes, which can be shifted into the back or front yards of properties owned by family or friends. Shane Savill, director of Dream Time Cabins, said people unable to afford traditional housing now make up the majority of his clients, and business had increased 40% each year since he started the company five years ago, spreading from Auckland to the regions. “The housing crisis is fuelling the demand, people can’t afford their own home, but they can afford a reasonable amount of rent per week so they put a cabin on their mum and dad’s property,” Savill said. House Me national sales manager Bryce Glover told RNZ that his company’s production of transportable homes had quadrupled in the last three years, and while the housing crisis was the main driver, the trend for tiny homes was also contributing. “There is no rule of thumb, we are dealing with all walks of life, and all different suburbs,” Glover told RNZ. New Zealand house prices are among the most unaffordable in the world, with Auckland the seventh most expensive city to buy a home, and all three major cities considered “severely unaffordable” by the latest Demographia international housing affordability survey. The Labour coalition government led by Jacinda Ardern were elected on promises to tackle the housing crisis, but the government’s flagship affordable housing scheme, Kiwibuild, has suffered numerous setbacks, and last month announced it would fall short of its target to build 1,000 affordable homes by June – and only manage around 300. Kiwibuild aims to build 100,000 affordable homes in 10 years, and Ardern has defended the scheme, saying although the short-term targets have been scrapped, the long-term goal will be reached. Alain Bertaud, a former World Bank principal urban planner, said despite New Zealand being an otherwise “exceptionally well-managed country”, its housing market was in a state of crisis. He said the government’s efforts were being closely watched because they were broadly following global best practice in improving housing affordability. Saadiya Aminu, MD/Chief Executive Officer, Urban Shelter Ltd., an Abuja-based real estate development company, in this interview, says getting Cs of O, access to land and infrastructure are some of the challenges hindering developers from delivering affordable housing. Urban Shelter is majorly an Abuja based housing developer. Why is it so? At Urban Shelter we provide real estate solutions and also have projects in commercial, retail and specialty projects. We are the first to develop a fully integrated estate, i.e. Karmo; then we moved to Katampe. We’ve been opening up neighborhoods for a very long time. Urban Shelter is also synonymous with Kubwa, our Brick City, and then we have Kado estate. Presently, we are involved in a number of projects in at least three locations in Nigeria, we are heavily based in Abuja, but we have other projects in Minna, Niger State and Kaduna as well, and I’m proud to say that now we are in Lagos. In Abuja, we deliver on the average a minimum of 300-400 houses per annum. We have a scale of projects from N3-100 million. We are active in Kyami, Lugbe, Kubwa, Lokogoma and Life Camp. We also have a retail development in collaboration with AMAC to develop over 2,000 shops in Apo district opposite Shoprite, we are developing it in phases. In 2018, we signed agreement with the Nigerian Mortgage Refinancing Company (NMRC) along with three other mortgage development banks, so that they can underwrite mortgages and they are really at favorable mortgage rates. Life Camp has been a phenomenal project for us. It is in three phases, we have delivered the first phase, 33 units. Phase two will be 71 units while the third will be about 150, so collectively we are looking at about 300 homes in that axis. We also have ongoing projects in Lugbe, 400 units on a 10 hectare land, with price ranging between N10 million and about N40 million; and Kyami, along Airport road just after Lugbe, with about 600 units. We have also signed agreements to provide houses for the Nigeria Police; we are also developing projects in Kubwa, near the Brick City with about 350 units. In Kaduna we have a 26 hectare project in the Millennium City, we are providing infrastructure. Observers say Urban Shelter builds houses so close to each other, why is that? When you make houses, you are guided by building code principles, so typically when we do our architecture plans we take it to FCT Development Control, we keep to their standards, that is what they approved. But in Abuja there is a premium on housing so land availability is a factor. But we have taken note. How is the Lagos business environment? Lagos is a bit difficult; their economy, their GDP is also mirroring some smaller African states, you have to take into consideration their different cultures. So tastes are different and the competition is very intense. The level of quality in terms of service delivery is higher in Lagos but we took our time, we prepared very well to ensure we are doing the right project for the right people. We have an official launching in March this year (of one of our projects). In Lagos we are the new kids on the block so we have to work harder. Handling so many projects simultaneously, how are you able to finance them? Finance is an interesting thing; our financial strategy differs from project to project. We have been utilizing commercial finance. We are now working on Islamic finance, which will unlock a lot of potential. It is difficult naturally but we are also trying to get international recognition and then we have internal revenue. Let me take a minute to appreciate our clients. Urban Shelter has been very fortunate; we’ve never finished a project that we have not sold out. On the supply side, in 2015 the value of the naira really depreciated, so also cost of materials skyrocketed, those that require forex became difficult. So, we would like to source materials locally, but if I were to order 5,000 doors there are few manufacturers that can meet the time frame so such issues like capacity, steel products you have to import, meaning port issues which will affect your timeline. And getting artisans, bricklayers, tillers, carpentry, giving attention to details, these are issues. So, we are trying to develop an Artisans Institute to mentor and train individuals. On the demand side, it’s easy to build a house, what is difficult is for you and me to buy the house. There is a limited pool in terms of the financial tools available to individuals to be able to access; and fast tracking the mortgage process so that people are able to pay, through mortgages, when we can unlock that process, that would make it easier. The other things which government may be addressing are getting Cs of O, access to land, infrastructure which is 10-30 per cent of the cost of construction, so these are the challenges. And on regulation, REDAN has been doing a good job of not just policing but ensuring quality and sanity. How is the company’s pricing? We start our pricing from N3.9 million for large studio rooms, and they go up to as much as N200 million. Like I said we try to cater for everybody. We have a research and development team that tries to see how we can get prices down without compromising on quality and safety. We are determined to see that we house as many Nigerians as possible because providing shelter is a basic human right. From atop his gleaming new headquarters, Salesforce CEO Marc Benioff has an inspirational view of mountains, the bay and an endless Pacific Ocean. But when Benioff looks down, he’s not so happy. Some 60 floors below his Salesforce Tower offices is what he calls “an inequality train wreck,” city streets “out of control” with thousands of homeless and often infirm citizens who have rendered sidewalks a landmine of feces and drug paraphernalia. Many have been destitute for years, but others are newly minted refugees of a housing crisis created in large part by the very technology boom that has made Benioff and other tech entrepreneurs billionaires many times over. That’s why Benioff, along with some of his tech peers and civic leaders, say it’s time for corporations in general, and tech companies specifically, to contribute financially toward fixing a problem that looms large from Seattle to Boston. Activists, meanwhile, warn that housing stock has lagged so severely in some cities that even huge infusions of cash will struggle to make an impact. San Francisco’s woes are particularly acute. Its housing stock is a quarter of its need, which has led to real estate prices that are among the highest in the nation. Some 15,000 tech positions were added in the city in 2016 and 2017, according to a report from brokerage firm CBRE. Seattle, another tech hub, has experienced the same housing deficit phenomenon, all while local tech powerhouses Amazon and Microsoft helped create 33,000 new tech jobs in 2016 and 2017, the CBRE report says. And as Amazon moves into Northern Virginia and Apple into Austin, local lawmakers and housing experts there are keeping careful watch on how an explosion of technology jobs will hit their communities. Across the nation, the influx of high-paying jobs in areas with limited housing has sent housing prices soaring for local residents. Since 2010, median home values in San Francisco have doubled to $1.37 million, according to Zillow. Seattle and Boston also doubled, to $730,000 and $600,000 respectively. Austin jumped from $212,000 to $364,000 in that time period. Benioff, whose family has been in San Francisco for generations, says more foresight should have gone into managing the tech explosion. “There’s been really poor planning in our state and our cities,” Benioff says with measured anger. Many tech giants say they are already reaching into their pockets to fund affordable housing solutions. Microsoft said because jobs have grown 21 percent since 2011 while housing has only expanded by 13 percent, the company would be investing $225 million toward building middle-income housing, $250 million to support low-incoming housing, and $25 million in grants to help those tackling homelessness issues. About a week after Microsoft laid out its plan, a San Francisco corporate consortium calling itself Partnership for the Bay Area’s Future announced it was halfway toward a goal of raising $540 million. The Partnership’s investment fund is aimed at providing financial assistance toward a goal of building 8,000 new housing units across the Bay Area in the coming years. Its policy fund will support initiatives to preserve and expand housing, with a particular focus on strengthening low-income tenant protections to guard against landlords evicting low-income renters so they can charge higher rates. Preserving affordable housing also is a mission of newly installed California Gov. Gavin Newsom, who has made housing a top priority. He recently sued the Southern California city of Huntington Beach for resisting efforts to build affordable housing. Ultimately, civic leaders and some tech leaders warn that ignoring housing issues is bad for business. San Francisco’s homeless problem already has caused some companies to plan lucrative conventions elsewhere, and an inviting urban core also is considered a key recruiting tool. “A place like the Bay Area is very diverse and vibrant, which is why companies want to be here and hire here,” says Caitlyn Fox, director of Justice and Opportunity for the Chan Zuckerberg Initiative, the foundation started by Facebook founder Mark Zuckerberg and his wife, Priscilla Chan. The foundation is part of the new Partnership for the Bay Area’s Future, along with Facebook, the Ford Foundation, Genentech, Morgan Stanley and others. It is not uncommon for tech companies flush with cash to create programs aimed at placating communities where they operate. Apple, which built a new billion-dollar headquarters in Cupertino, California, a few years ago, said it had contributed to $1.8 million to area bike lanes, and added that in 2018 its employees had donated more than $125 million to non-profits around the world. Representatives at the iPhone-maker would not say whether it has plans to work with local officials on housing issues, including in Texas, where Apple’s plan to build by 2021 a new 133-acre campus in Austin would make it the largest private employer in the city. In Seattle, Amazon said it has donated $40 million to Mary’s Place, a local homeless shelter. Working with the non-profit, Amazon has created two temporary homeless shelters on its campus, which will become permanent in 2020. But Amazon also has come under heavy fire for contributing to rising inequality in Seattle, as well as for successfully killing a head-count tax on employees — $275 per worker on companies making more that $20 million a year — that would have raised money partly for affordable housing. “When Microsoft announced their news, the feeling here was, ‘OK, Amazon, what are you going to do?’” says Jeff Shulman, a marketing professor at the University of Washington who has been studying Amazon’s impact on Seattle’s growth. But, he adds, such cafeteria workers, janitors, teachers, child-care workers increasingly find themselves priced out of the areas in which they work, resulting in endless commutes along clogged roads. “Tech companies need to lure talent, and for those employees quality of life includes where they live, how they get to work, where their kids go to school and even cultural amenities. But the housing crunch is pushing all but those paid big tech salaries far away,” says Shulman. And just recently, Amazon abruptly pulled out of plans to build part of its new headquarters in the Queens borough of New York City after politicians and activists there raised questions about the company’s financial commitment to the region while receiving $3 billion in subsidies. Real estate agents in New York had already starting seeing evidence of an “Amazon effect” on prices just as a result of the announcement that the everything-store tech behemoth was moving to New York and Virginia. Michelle Winters, executive director of the Alliance for Housing Solutions in Northern Virginia, says so far Amazon has not said how it plans to help beyond bringing thousands of jobs to the area. She remains optimistic, but fears the worst. In San Francisco, Fernando Marti, co-director of the Council for Community Housing Organizations, a non-profit that crafts affordable housing public policy, says he is grateful for the newfound corporate focus on the housing crisis, but is also skeptical about whether the gestures are too little, too late. Marti points out that, for one thing, in the Bay Area even $500 million doesn’t go far. Consider that at an average home-building cost of $300 per square foot, a new 1,500-square-foot home would cost $450,000 to construct. That means $500 million would only build 1,111 new homes. Indeed, the California Dream is proving increasingly elusive, especially for younger residents. A recent Quinnipiac University poll indicated that 43 percent of California voters said they couldn’t afford life in the state, while 61 percent of 18 to 34 years old living in the world’s fifth largest economy said it was beyond their means. In Silicon Valley’s backyard, only high-end housing needs in San Francisco have been met over the past four years ending in 2017, according to CASA, the Committee to House the Bay Area. In contrast, over the same period, low-income and middle-income housing demand outstripped new housing supply four to one. One solution may well be to leverage technology itself to make housing construction more affordable. That’s the mission of Factory OS, an new company(OS stands for off-site) just north of San Francisco that takes an automotive assembly line approach to building. OS builds apartments in its factory at around a 30 percent costs savings over on-site construction. Factory OS already has an order from 300 small apartments from Google, which is looking to add short-term housing options for employees who come to its Mountain View, California, headquarters to work on projects. Company CEO Rick Holliday says he was forced to innovate due to the pressures he’s facing from the very housing shortage he’s hoping to alleviate. 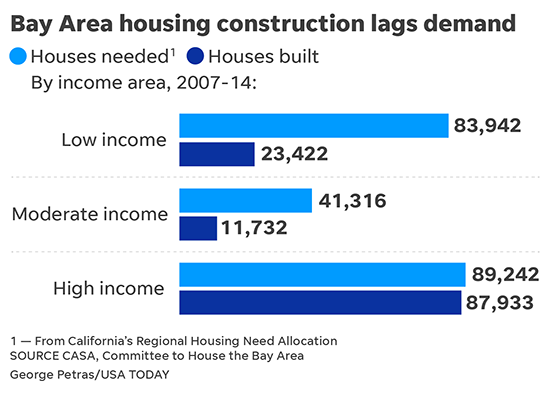 “We’re in a mess, and part of the issue is my own labor shortage,” says Holliday, who said between unaffordable Bay Area housing and younger workers not getting into building trades, he has lost 30 percent of his workforce in recent years. Tech leaders are far from reaching a consensus on how — and even whether — to pay for affordable housing. Benioff, for example, was a huge backer of San Francisco’s Proposition C, which passed in November. It stipulates that any company with revenues over $50 million would be charged 0.5 percent on income over that mark. So if you pull in $55 million one year, you’d be assessed $25,000 in Prop C taxes. While that’s a small amount for many of the roughly 400 area companies affected by the law, supporters estimate that the city will be able to collect around $300 million a year from the tax. That money would go toward 1,000 new beds for the city’s homeless and also over time allot $150 million to 4,000 new housing units dedicated to lower income families. But the San Francisco Chamber of Commerce, along with some tech entrepreneurs, opposed the measure, arguing that the tax could drive companies away from San Francisco. Benioff and Twitter founder Jack Dorsey even got into an online feud over the matter, with Dorsey predicting that smaller companies would get disproportionately hurt by the measure. The city has started to collect these taxes, but nothing has yet been distributed because the measure is facing a court challenge as it did not pass by a two-thirds majority. Benioff hails Proposition C is an example of how big change can come from public-private partnerships. Ultimately, however, he said a solution can’t be reached if multi-billion-dollar tech companies don’t see pitching in on housing as a fundamental part of their corporate responsibility. The government of Kenya has announced to have received US $26bn investment pledges towards the country’s low-cost housing plan. This is according to Charles Hinga, the Housing Principal Secretary. Affording housing plan which is among President Uhuru Kenyatta’s big 4 agenda others including; manufacturing, food security and universal health care had earlier on plunged in the rocks when high court dismissed the 1.5% monthly tax levy that was imposed on workers meant to finance the housing plan. Central Organisation of Trade Unions had last year filed a case against the government’s proposal on the tax levy and was to commence on January 2019. However Mr Hinga said that they had reached an agreement with Cotu to drop the case and settle it outside the court. “We had a court issues with Cotu but they have since agreed to drop the case and we will settle it outside the court, we expect the official filling either on 23 or 24 this month” said the Housing Principal Secretary. The State department for housing and urban development has tabled regulations in parliament needed to operationalize the tax levy. Upon approval by members, Kenyan’s will start paying the tax to finance the housing projects. “We have already defended the regulations before the Delegated Committee and now waiting for parliament to approve them. Development framework has also been approved by the cabinet,” added Mr Hinga. According to World Bank Kenya has a deficit of 2 million housing units with 70% living in urban centre slums. In addition the country needs to build at least 250,000 units each year against the 50,000 units which are built each year in order to reduce the deficit in the next 5 years. A third of councils in England are failing to tackle the housing crisis as they are not delivering the new homes needed and could face sanctions, official figures show. The data from the Ministry of Housing, Communities and Local Government (MHCLG) shows that 108 local authorities failed to meet the 95% delivery target. They are now required to set out action plans to explain why they missed their targets and how they will address the failure. These figures are published for the first time and will be used to incentivise councils to drive up housing delivery. The new Housing Delivery Test has been calculated using figures for total net homes delivered over a three year period which is divided by the total number of homes required over a three year period. The figures also show that another 87 of these local authorities failed to deliver 85% of the homes they need and will therefore be subject to a buffer, which requires them to add 20% more homes to their five year land supply. No area delivered fewer than 25% of their housing need, which means none will face the ‘presumption in favour of sustainable development’ penalty. However, the presumption penalty threshold will increase to 45% from November 2019 and to 65% in November 2020. If the Government had not given areas three years to meet the 65% threshold, 32 local authorities would have been subject to the penalty. ‘These figures show that a majority of councils are rising to the challenge and delivering the homes their communities need,’ said Housing minister Kit Malthouse. The tests have been welcomed by the National Federation of Builders (NFB) which said that while it recognises the challenges local planning authorities face in meeting the demand for housing, it is concerned that so many councils are missing their targets, leaving q shortfall of more than 220,000 new homes. According to Richard Beresford, NFB chief executive, members would have preferred local authorities be in control of their own housing destiny but, since many are failing in their duty to meet housing demand and underestimating housing need, incentives are needed. ‘Since the carrot of meeting housing need themselves is not enticing enough for local planners, the Government’s stick of penalties and buffers is clearly required. We have a housing crisis and the Government is taking appropriate steps to fix it,’ he said. Rico Wojtulewicz, head of housing and planning policy at the House Builders Association (HBA), believes that councils need to do a better job assessing housing need and identify where homes can be built more quickly. ‘If they continue to underestimate demand and focus on large, controversial developments, we expect the housing crisis to worsen and the Government to take control from failing councils,’ he said. Savings and credit co-operatives (saccos) have cited high interests rates, hidden charges in mortgage schemes and inadequate funding as stumbling blocks in the realisation of the affordable housing dream. Kenya Union of Savings and Credit Co-operatives Ltd (Kuscco) national chairman George Magutu said although the saccos have the potential to contribute in the realisation of the low housing agenda, there are several bottlenecks. “This will enable co-operatives not only produce raw materials in terms of farm produce, but also process and sell finished commodities to an ever growing market,” he said. Kuscco managing director George Ototo said unfair taxation by the various government agencies is affecting their business. He said the amendments to the income tax act, through the Finance Act 2018, doubled the withholding tax rate on dividends payable to members to 10 percent up from five percent. He said this will make saccos struggle to meet capital adequacy ratios required by Sasra if the motivation to save is interfered with. Affording housing plan which is among President Uhuru Kenyatta’s big 4 agenda others including manufacturing, food security and universal health care had earlier on plunged in the rocks when high court dismissed the 1.5% monthly tax levy that was imposed on workers meant to finance the housing plan. Central Organisation of Trade Unions (Cotu) has last year filed a case against the government’s proposal on the tax levy and was to commence on January 2019. However Mr Hinga said that they had reached an agreement with Cotu to drop the case and settle it outside the court.